Power Over Ethernet technology allows IP telephones, wireless LAN Access Points and other appliances to receive power as well as data over existing LAN cabling, without needing to modify the existing Ethernet infrastructure. 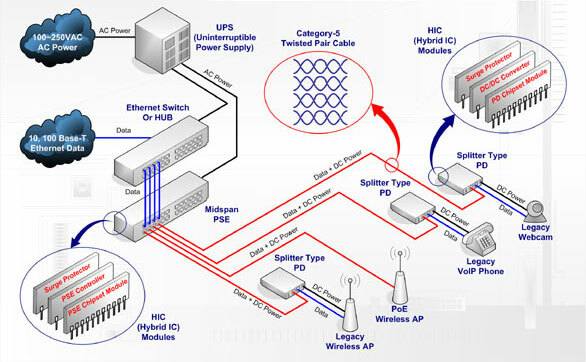 It has just become an international standard, called IEEE802.3af, as an extension to the existing Ethernet standards. The freezing of the standard will allow an explosion of Power Over Ethernet devices and installations. Power Over Ethernet is likely to be ubiquitous in a few years, as the cost of adding the power supplies to the Ethernet switches is going to be small. Indeed, it offers the first truely international standard for power distribution. Below figure shows a typical system. In the wiring cabinet existing Ethernet switch equipment is retained and a “midspan” power source injects power into the twisted pair LAN cables. At the other end of the cables the power is used to run phones, wireless access points, cameras and other appliances. An Uninterruptable Power Supply (UPS) can optionally support the installation in the case of power failures.